I am working on some projects that need power drivers. I have a bunch of NPN Darlington arrays that I have salvaged from old dot matrix printers, but I don't have the pinouts or voltage/current ratings for these devices. Here are a couple of the more popular numbers: FT5761 and MP4501. There is also an MTA001 that appears to have nine Darlingtons in it. Any help would be much appreciated. These are very interesting, versatile, and free devices that can be used in a wide variety of experiments and applications. As a rule, the transistors (Darlington, all) are rated three amps at 100 volts, with a gain of about 2000. 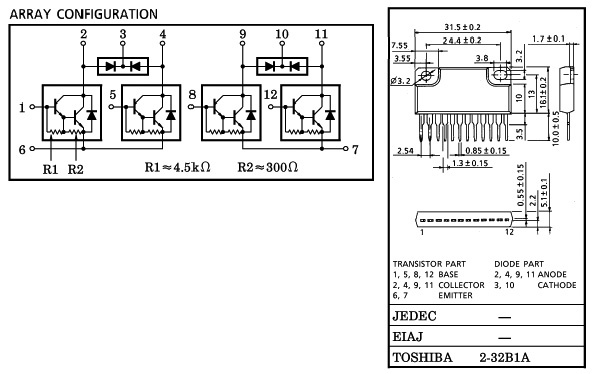 Here are the pinouts for the MP4501; the pinouts are almost identical for similar devices.